Summary: When Monique finds out her brother, Kieran, is planning her future with the one fairy she wants nothing to do with, she seeks refuge in the human world. Now Kieran fears she will be the next victim in a string of murdered fairies and is determined to bring her home. The Review: Monique has fled to the human world to escape an arranged marriage to a less-than-worthy fairy. Although tough, she manages to get by each day by taking various jobs and moving every couple of months all the while relying on her fairy power that allows her to manipulate humans. But when she meets Daniel, everything changes. I really enjoyed seeing this story develop and was pleasantly surprised with how all of the plot points ended up melding together into one. I had my suspicions of Daniel’s family but did not expect who the runaway fiancée was. It was a little difficult for me to get into the instant love between Daniel and Monique, and I honestly struggled with it up until the very end. But once Daniel’s family history was revealed, I was able to believe that there could be an innate attraction between the two within a very short amount of time. The character development was really well done, and I especially enjoyed Billy. Monique tended to be a little too whiny at times when it came to her jealousy over Veronica, but that was usually overshadowed by the rest of the great dialogue and character interactions. 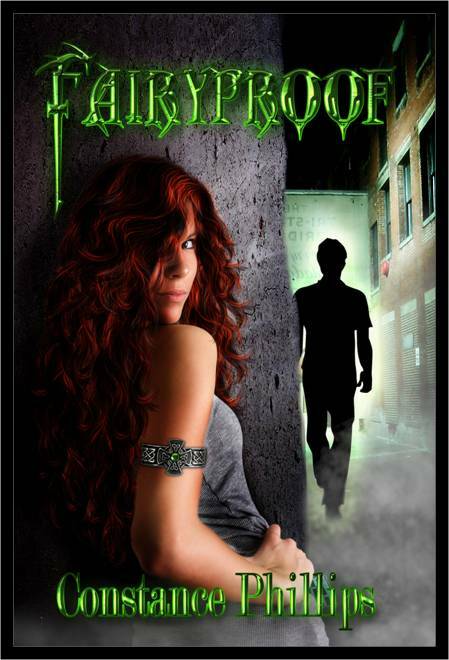 Constance has created a believable world that any urban fantasy fan would surely enjoy. The Good: I love fairies and think Constance did a wonderful job incorporating their mythology into the human world. Totally my cup of tea! The Issue: There seemed to be several instances when the POV would change mid-chapter. This threw me off and I was forced to re-read some sections in order to understand which character we were hearing from. The Rating: 4 conch. Fast paced, great characters and an entertaining read. 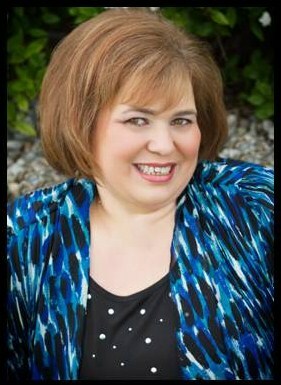 And today I have a special Author Interview with Constance Phillips. Keep reading below to enter the giveaway! 1. Tell us about Fairyproof in 140 characters or less. Fairy and Human must overcome two worlds of differences if they are to have a chance at love and happiness. 2. Who should read your book? Of course, I want to say everyone. (Ha!) But I think it will appeal to those who want a fast-read, like romance, and enjoy some paranormal lightly sprinkled in. I built this story around the characters and their core conflict. The idea of a heroine who is used to being able to get what she wants and a hero who’s completely immune to her special abilities. The old lore of fairies have an undeniable magnetism seemed to work well with the premise. 4. Who did your cover art? What was that process like? The cover art was done by Taria A. Reed. The publisher hired her. I filled out one of the standard cover-art sheet that asks for input. She took the premise behind the book and what little bit I gave her on the sheet and designed something beautiful and fitting. 5. What goes through your mind when reading reviews (positive or negative) of Fairyproof? So far, I’ve been lucky enough to only see positive reviews. I know that the book will not appeal to everyone, and eventually someone will have some criticism, but, for the time being, I’m enjoying the positive. When I wrote the book, I just hoped that it would someday be read. Now that it’s happening, it’s all very surreal. 6. Are any of your characters based on someone you know? The short answer is no. Not one single character is based on one single person I know. However, I’m very much a people watcher. Many of the characters probably have bits and pieces of people I know, or people I’ve observed over the years. 7. Who is your favorite character in the book and how would you spend a day together? At the time I was writing Fairyproof, it would have been a tossup between Daniel and Monique. They both have their individual strengths and their problems to overcome. A picnic in the park, (like in the book) would be a great way to spend the day. Now, I’m in the process of writing a book for Monique’s brother Keiran, and the way he’s developed in the manuscript has made him my current favorite. Keiran is very much about his work and what’s best for the fairy realm, so I think I’d like to spend the day trying to get him to relax, maybe go for a hike. 8. What superpower would you like to have and why? Flying, I think. It would be incredibly freeing to be able to soar through the air! 9. Finish this sentence: I wish I had written…. Crescent Moon Press has contracted a second book, not related to Fairyproof, from me. It’s called Resurrecting Harry and I imagine it will be out next year. In the meantime I’m writing a book that would be a follow up to Fairyproof and working on editing a couple of contemporary manuscripts. Constance blogs regularly at www.constancephillips.com. You can also follow her on Twitter or friend her on Facebook. 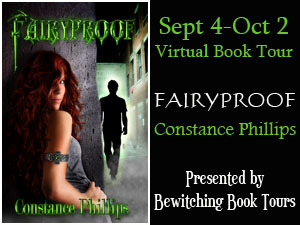 Thanking for featuring Fairyproof on your blog and for interviewing me! That door is super cute ^.^ very creative! Thank you for reviewing and offering this giveaway! The cover looks awesome! Thanks for the giveaway!